Samurai Showdown was an equal opportunity Hack & Slash game, with women getting chopped just as bad as men. When thinking of the great 2D beat-em-ups of all time, it’s easy to not look too far beyond the mega-popular Streetfighter brand. 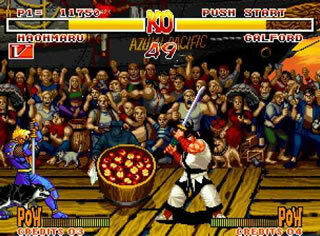 But those without blinkers on could nod approvingly in the direction of SNK’s Samurai Shodown series, a collection of six superbly arranged one-on-one fighting games from the nineties that, with the added bonus of weapons for all concerned, took the formula and run with it as far as it would go. The main problem originally, was that although they were superb games in their own right, they never reached as many homes as their quality deserved (due to the Neo Geo console’s wallet-emptying price structure) – this glaring oversight is soon to be corrected however with the release of Samurai Shodown Anthology on Wii. The beauty of such a release is that, due to the relative lack of original ownership, a great deal of folk will be playing these for the first time, and with six full arcade-replica versions on one disc, it acts as a superb introduction to the series. So why the big fuss? Well, the Shodown series has developed a huge cult following over the years (especially in its native Japan where it’s known as Samurai Spirits ) thanks to its huge, likeable characters, its clever use of weapons throughout and those little moments of humour and charm that SNK do so well (anyone familiar with the Metal Slug series will know what I mean) – re-releasing retro games is all well and good, but they still need to put a smile on your face when you play them, thankfully, this Anthology has had me grinning from ear to ear. The Wii's controls work surprisingly well for this game. But it's best played with a classic controller. The front-end is functional if unspectacular, and the usual myriad of options are there for you to tinker with. From that, it’s onto your choice of version and character and away you go. Pure nostalgic heaven. The first thing that’s apparent is that it suits the Wii pad well – trigger buttons are used for attacks (in the form of light, medium and strong attacks) whilst the control pad takes care of your movement. And you’ll be triggering loads as you fight your way through the basic ‘win one bout, move onto the next rival’ premise that runs through the whole series. Two of the series’ main selling points were its superb use of zooming in and out of the action and its slow-motion moments, they’re features that still look cool today, and it’s all remarkably smooth and polished. As you would expect from such a release, the original Shodown is slightly more rough-around-the-edges than the rest, but is not any the worse for it. It still plays remarkably well considering its age, as do all the more recent versions. Shodown IV : Amakusa’s Revenge is my pick of the bunch, and is possibly the one edition where they got it all absolutely spot on. Yes, the cynics may say it’s six games of fairly repetitive fare, but each version warrants checking out due to the progressive difficulty setting and the adding of a plethora of new characters (and WHAT characters! as you move on through to the later versions, there are some unique and wacky ones to say the least. My favourite? Wan-Fu – a man the size of a people-carrier, with an enormous boulder to swing around. Nice). As with all the best 2D fighting games, these look simple on the surface, but dig deep and the real challenge comes from spending time discovering all the moves and characters traits. And, evaluating it now, it’s interesting to see how the series improved and morphed over the years with every version looking smoother and bolder than its predecessor. I could never fully understand why SNK got a slightly rough deal from some (not all, just some) of the gaming press for their superb Metal Slug Anthology (I urge everyone to play it, a pure full-flat slice of retro cake), but thankfully they haven’t deviated from the same formula, and consequently it’s supreme value for money. Six quality arcade games brimming with charm and 2D joy – if you’re a fan of the series, fighting games or just some well put together retro gaming you should check it out, you won’t be disappointed. Right, I’m off now to try and knock out a small wizard-type fella with a huge oversized chain – something tells me I’m going to start grinning again very soon. 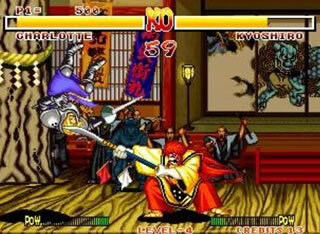 Samurai Showdown is out on the Playstation 2, PSP & Nintendo Wii. I think the main reason the Metal Slug Anthology was slammed was because people used the Wiimote and nunchuk to play it. Once you use a Gamecube controller it’s much more playable as I found out and I updated my review of the game. Not a big beat-em-up fan though. I’ll probably give Samurai Showdown a miss.